"Like" token, awarded by Lsanabria. We need to develop a consensus on what, if anything, to do about this. Change feedback so that it behaves like other Quiz systems, i.e. GIFT: https://docs.moodle.org/20/en/GIFT_format#Feedback and only show feedback from selected answers. 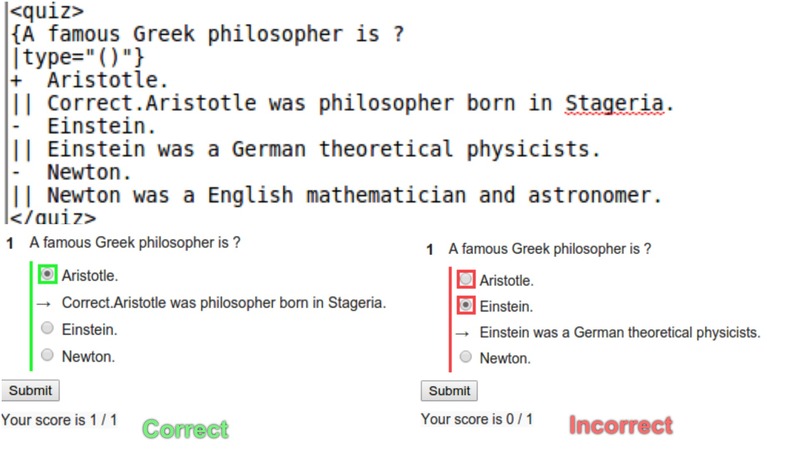 Extend the Quiz format such that conditional feedback is possible, i.e. keep the current type where feedback is always shown, but add other types of feedback that are conditional. If so, this also needs further discussion. There are several options, i.e. Input is also needed on the notation. Would this change the structure of the Quiz format then? We should consider carefully how to design this before implementing it, i.e. discuss an example format of how to accomplish this. Yes It would change feedback markup. |+| Feedback for correct answer if question answered is right. |-|  Feedback for correct answer if question answered is wrong. |+| Feedback for distractor if question answered is right. |-| Feedback for distractor if question answered is wrong. The quiz should also work even if only |+| or |-| are given . The following will only have feedback for correct option displaying Congratulations if the answer is right otherwise it would give feedback as negative. |+| Congratulations you answered correctly ! It would need to be backwards compatible with current quizzes. || For wrong, and that would be consistent with the first change we make, to only provide feedback if it is wrong? and then add |+| for if it is right? |+| causes feedback to be displayed for any correct answer. |-| causes feedback to be displayed for any incorrect answer, whether false positive or false negative. All three could be used in any given question, so feedback that is displayed no matter what, plus feedback displayed whether right or wrong. Also useful: seeing how feedback is done in GIFT: https://docs.moodle.org/20/en/GIFT_format#Feedback which we had a prior project to convert quiz format to. Mvolz merged a task: T159952: Only show feedback for proposals that have been attempted using CSS. Mvolz added subscribers: Elitre, Whatamidoing-WMF, gerritbot. Mvolz added a project: Community-consensus-needed. @jayvdb and @Miriya52 might be able to provide some more input as they have experience with the quiz format as well. But also I think we should do a RFC from the various Wikiversities @Elitre or is that overkill? I know where to ask on en wikiversity (the colloquium) but not in other languages. Changing the feedback to behave like GIFT Quiz system seems appropriate. Only feedback for selected proposal/answer will be shown in this format. The markup will remain the same i.e || for feedback, but it will only be shown if the proposal/answer has been selected. Also if no answer is selected i.e the question is unanswered then no feedback will be shown ( this will also tackle bug T159952 ). It would work the same way in multiple choice multiple response but will show multiple feedback based on the answers/proposals selected. @Mvolz See https://www.wikidata.org/wiki/Q16503 for all Wikiversity's village pumps. Does this help? Yes, very helpful; this is declined in favour of https://phabricator.wikimedia.org/T159952 but that is good to notify the wikis if they would like to change their common.css to change it back to the old way if needed :).